In Fight Over N.D. Pipeline, Tribe Leader Calls For Peace And Prayers Protests against the Dakota Access Pipeline have been raging. Tribe leader Dave Archambault II says he's telling supporters "not to react to any form of aggression that law enforcement brings." Dave Archambault, chairman of the Standing Rock Sioux tribe, stands outside a federal courthouse in Washington, D.C., on Oct. 5. Protests against the Dakota Access Pipeline have been raging for months, but tensions have been escalating. 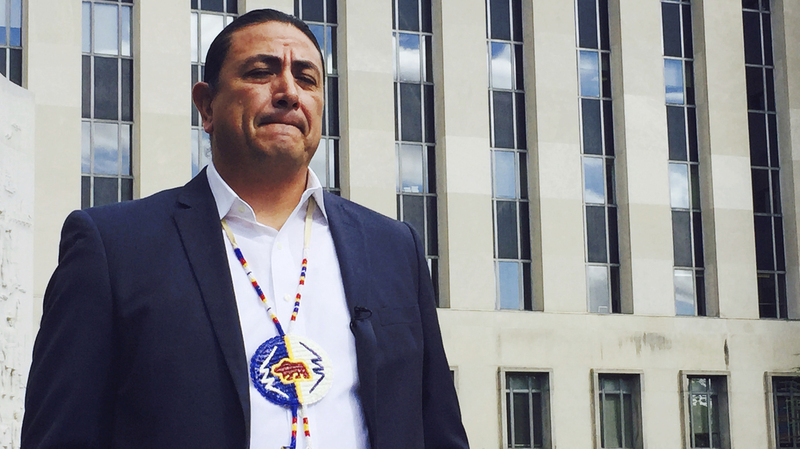 Recently, tribal leaders — led by Standing Rock Sioux tribe Chairman Dave Archambault II — called on the Department of Justice to look into what they describe as unnecessary use of force by state and local law enforcement. The tribe is going up against Energy Transfer Partners, an oil giant intending to build the $3.8 billion pipeline to carry more than a half-million barrels of oil a day through four states and their watersheds. The tribe wants to stop it. Earlier this month, the Standing Rock Sioux lost an appeal, paving the way for the oil giant to build. Protesters have set up camp on the land. Police have been brought in. More than 100 have been arrested. In his letter to Attorney General Loretta Lynch, Archambault says the state has militarized the reservation. Archambault tells NPR's Renee Montagne how he's advising his supporters. "What we're doing right now is we're asking everybody to remain prayerful and peaceful and not to react to any form of aggression that law enforcement brings. We don't want to see the construction workers get hurt, we don't want to see law enforcement get hurt and we definitely don't want to see people who are standing up to protect water to get hurt," he says. "And by no means do I say that everybody who's standing to protect water are angels. But when you have law enforcement bringing aggression and when you have law enforcement and the company boxing everybody into a corner, it's really hard to resist reacting." Explain what you mean when you say the pipeline is endangering the Standing Rock Sioux tribe's treaty rights, sacred sites and water. When this pipeline comes through it's putting our safe drinking water at risk, and it's also going through areas that were our original treaty lands. What happened was that the federal government entered in a contract with our tribal nations, Great Sioux Nation. They identified lands that we agreed to because we knew that there are secret sites there. But this is what's kind of disturbing is the Westerners kept coming and they kept encroaching on that land. Clearly these treaties were broken, and they were broken over time beginning long ago, but at the moment, the land legally belongs to Energy Transfer Partners. Now, protesters have physically moved onto that property. Is that ratcheting up the whole protest? You have to look at what our purpose is. What are we doing and why are we doing it? Our purpose is to protect the water. And no matter what we do, nobody cares. And ... they're going to force this down our throats again. This pipeline helps North Dakota take advantage of newly discovered oil and is seen as important for the economy there. Does that not benefit -- like providing jobs — the people of the Standing Rock Sioux tribe? There's no benefit to Standing Rock Sioux tribe and the members for the destruction of land in North Dakota to extract fossil fuels. Here's what's happening. The price of a barrel was dropping, so the Bakken crude extraction has dropped by 80 percent. We're building this pipeline and the crude oil is dirty oil. That takes a lot of energy to refine. So they want to pipe this oil and threaten fresh clean water, threaten the environment, have eminent domain takings for the purpose of who? Who benefits from it? It's the billionaires who have oil interests who want to make more money. So this becomes more about greed. This protest has become a sort of rallying cry for indigenous people who've come from as far away as Hawaii. Did you expect that? No, I didn't expect that. We have support from around the world. We have support from over two dozen cities, major cities. We have support from indigenous peoples in other countries. I can't tell you how much I appreciate people willing to stand beside us as we go up against federal government, go up against state government and go up against large oil industry companies. We have no power, but the only thing that we have is support from around the world.